Initially, I had envisioned this first post entitled: "Resolved." This vision, however, occurred in early January, a time when New Year's Resolutions are flying through the air with wild abandon, assaulting our guilty consciences with their unrealistic grandiose intentions...And here it is, well into February. Oh well, I never really buy into resolutions anyway. Thus, "Work in Progress," because isn't that truly what life is all about? Working it out as we go along, and hopefully enjoying the ride. Which I invite you to do here with me, ride along as I work this whole blog realm out, and maybe, just maybe, I will discover a voice...preferably one that entertains and makes a few of you smile. I have been gently encouraged, pushed, and recently, nagged (in a kind way) for nearly a year (I'm rather slow on the follow through, folks) by my husband, Stuart, and dear friend, Monica, to get this blog up and running. My first protests had to do with fearing technology and whatnot, and isn't everyone already blogging? Those issues resolved, I, in a likely whiney (and possibly wine-y) voice complained to Monica: "But what if I have nothing good to say?!" And she, ever-supportive: "When has that ever stopped you?" Well said, friend. Indeed. So, here we are. I'd like to share a little recipe I've been having some success with for some months now, for bread. I've been playing around with ingredients and techniques, and have come up with a good, tasty, and somewhat healthy loaf. Think rustic, free-formed, kinda ciabatta-esque. I've tried it purely from scratch, all the kneading done by yours truly, and phew! That is a work out for which I honestly don't usually have the time, or the inclination. It does feel pretty cool to say afterward, "I made this with my own two hands." However, the sheen of sweat on my brow may deter you from tasting it. And so, after receiving a new bread machine for Christmas (thanks Mom), I do the kneading cycle in the machine, saving myself a heck of a lot of work, and time. If you're interested in making bread from scratch, there is an incredibly marvelous book: The River Cottage Bread Handbook, by Daniel Stevens. I learned a heap of useful stuff from this one, especially how to form the loaves, and let them rise properly, ensuring that lovely, crisp crust on the outside, and light, airy core. Yum. Serious yum. Also, I should preface this photo with the disclaimer that I possess a fairly rubbish camera at the moment. So bear with me, or just close your eyes and picture a beautiful loaf of bread. Because this photo, my friends, does not do the bread justice. Here's the recipe, and feel free to play around with it. Bread, like life, is a work in progress. *You want a total of 3 1/4 cups flour, so with 2 1/2 cups bread flour, use 3/4 cup whole wheat flour, etc. Once the Dough Cycle is complete, and your bread has done it's rise in the machine, gently remove it from the bread pan, and let it rest on a lightly floured board, covered with a large bowl, for 15 minutes. Using either a large, sharp knife, or a dough scraper, cut dough into 2 pieces, and shape into rounds. (Here's where River Cottage Bread Handbook comes in handy!) Basically, you want a nice, tight skin to hold things together. I gently tap the dough into a flat round with my fingertips (you don't want that first rise to be wasted, so go easy.) Then, take a "corner" of the dough, and fold it in to the middle, pressing down with your fingertips. Turn the dough, and do this all the way around, until you have done a full circle. Now, flip that baby over, and with a hand cupping each side of the dough, begin making a quarter turn clockwise, while sort of twisting the dough with a little pressure, on the lightly floured board. Continue on, going a quarter turn, over and over, around and around. The idea here is to form that skin, and seal up the folds you made on the bottom. It takes some practice, and I am possibly not explaining the most eloquently. But you will get this. And it is very worth the effort. After you've shaped both loaves into rounds, you want to flour them and cover them to keep in the moisture, so the bread doesn't dry out. Lots of people use a tea towel, spritzed with water. I like Daniel Steven's suggestion of using a garbage bag over both loaves (leaving room for them to double and not touch! ), tucking the bag around the edges of the board. Leave in a warmish place, possibly near a heat source or fireplace, or just in a warm room, around 70 degrees (not too hot, or your yeast will get a little too excited too early, and we know how what a let down premature excitement can be! ), until doubled in size. This usually takes around 45 minutes to an hour...but it all depends, so just check in periodically. Here's where you get to play around. You can either reshape your dough, just as above, and let your bread rise again, which will give you an even lighter, airier loaf, or if you absolutely cannot wait, set your oven HOT, at 500 deg, about 1/2 an hour into the above rising. Five minutes before you're going to bake your loaves, put a baking stone or sheet in the oven to preheat. Get a water bottle ready to spritz the loaves, and if you like, put a roasting pan in the bottom rack of the oven and set a kettle to boil water. (This is an extra step that may be viewed as a pain, but the steam does give the crust some serious depth and texture, if you can be bothered.) 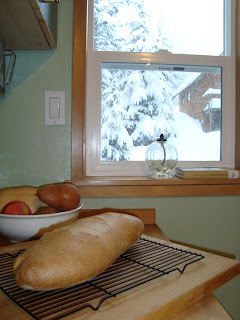 When you're all set up, and the water has boiled, pull your baking sheet out of the oven and very gently transfer your loaves to it, quickly slash with a very sharp, serrated knife, diagonally a couple of times, 1/4 inch deep, to allow more expansion; spritz with water from the water bottle and get it in the oven; pour in about an inch or so of boiling water into the roasting pan, and shut the door. And heave a sigh of relief, because that was A LOT. After 10 minutes, check in on the loaves, if they are browning like crazy, turn the oven down to 325, and continue baking for 20-25 minutes more. If they are still very pale, turn the oven to 400, and continue baking for 20-25 minutes. And, since there is just SO MUCH variation in bread, if they're just lovely and golden, turn the oven to 350, and bake on for yep, another 20-25 minutes! The loaves are done when they sound hollow when tapped on the bottom. You can always stick it back in the oven for another 5 minutes if it doesn't seem quite there. The crust may be quite brown at this point, or it may just be golden...it all depends on your oven, your ingredients, the weather...But it's best to slightly overcook a loaf, than to undercook it, because the inside will be all gluey and stodgy. Which is still quite forgivable considering you just made this yourself, so hello! Pat yourself on the back, regardless how it turns out...this is a work in progress! Common bread wisdom at this point says that you must let your bread rest and cool for 20-30 minutes before slicing, and it's true, it is best that way. But by this point, even if your loaves are not perfect, your house will smell absolutely heavenly, your stomach (and/or your family) will be grumbling for a taste...and sometimes, you just can't wait, so do what you must! And enjoy.